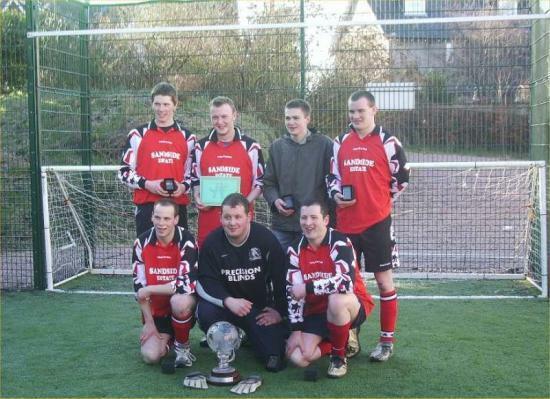 A team from Halkirk YFC won the Scottish Association of Young Farmer's National 5-aside football competition on Sunday 26th February at the National Competitions Weekend in Oban. A total of 15 teams took part. The format was two leagues of seven and eight with matches played for 7 minutes. Halkirk were joined in their group by Bell Baxter, Brechin, Inver Ross, Thornhill, Lanark, North Argyll and Bathgate. After finishing the group stages unbeaten with 24 goals scored and only 2 against, Halkirk played Dunlop in the semi-finals and won 4-1 to reach the final. In the final they met Thornhill once again, winning by 3 goals to 1 to take the trophy to Caithness for the first time. Scorers in the final were Jamie Riddell (penalty), Willie Budge and Graeme Gunn who was also top goal scorer. Making up the squad was Roddy Gray, Bryan Sinclair, Martyn Cook, Bryan Hossack, Jamie Riddell, Willie Budge and Graeme Gunn. The coach, Andrew Gunn, said afterwards he was proud of the way the boys played and was delighted to see them lift the trophy. The only disappointment being the serious hand injury picked up by Bryan Hossack in the first game to rule him out of the rest of the competition.